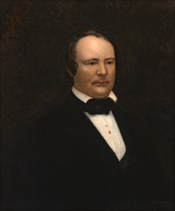 James Orr’s Speaker portrait was South Carolina artist Esther Edmonds’ first commission. The work was initially awarded to her father, Abraham Edmonds, but, according to Charles Fairman’s Art and Artists of the Capitol, the elder Edmonds was “unable to comply with the terms.” In fact, Edmonds' father died before the portrait could be completed, and she, trained at Cooper Union and The Art Students League, took up the work in his stead. The posthumous likeness most closely resembles an unattributed engraving of Orr that appeared in a 1857 Harper’s Weekly, where Orr similarly appears bust-length and clean-shaven.